Recently Redwood Plastic contacted a client who was restarting a bottling plant. The original equipment manufacturer was located in Europe and a variety of parts would need to be sourced via expensive and time-consuming shipping. After consultations with the Plant Operations Manager, 500 examples (100 each of five different parts) were produced with design modifications which ended up improving production. These new parts not only saved our customer costly shipping fees, but they saved them time, and increased their production. 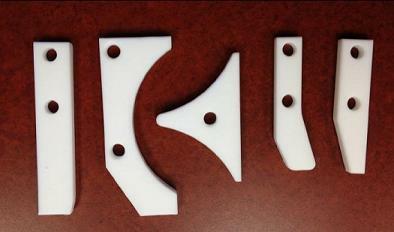 All parts were fabricated with Redco PTFE, which has the lowest coefficient of friction in our current product line. It is non-reactive, self-lubricating, and has excellent temperature tolerance (up to +500F). Redco PTFE makes an excellent choice for a variety of parts, especially when sliding between parts or on surfaces.